Forgetting a user account password can be a major frustration, but fortunately there are a some simple and secure ways to recover and reset a lost password on any Mac. One of the best ways is to use an Apple ID, which allows a user to reset an OS X login password by using the same Apple ID that is used for the App Store, iTunes, iCloud, and Apple Support. This works in all new versions of Mac OS X, including OS X Yosemite, Lion, Mountain Lion, and OS X Mavericks, and is extremely fast and easy, making it a preferential choice for most users rather than going the command line route of resetting a OS X password with the passwordreset tool, or by creating a new user account. The best thing about this password reset method is that it’s extremely fast, and so long as you have internet access you’ll be using the Mac again in literally about a minute, minimizing any potential inconveniences of losing passwords. Understand the caveats before beginning: this method only works if you set an Apple ID to tie with the OS X user account, the Mac must have internet access to use this feature, and this option won’t be available for some users with FileVault protection enabled. Also note that this leads to the creation of a new keychain, but the old keychain will remain intact if you do recall the old password sometime down the road, which you can then unlock later. 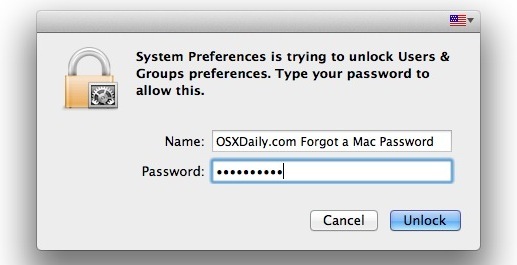 The Mac will boot directly into the user account, with the new password set. 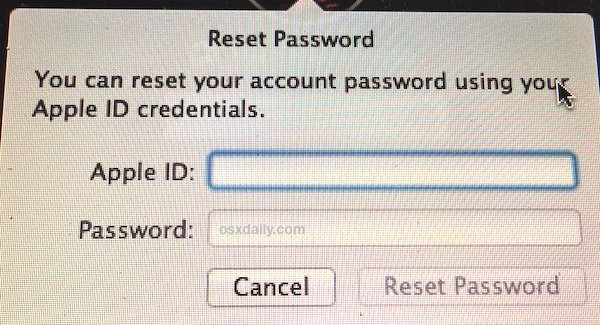 If there is no Apple ID attached to the user account, use the passwordreset tool or new user trick, and the more complex methods from Mac OS X continue to work as well with just about every version of OS X. Though the latter is certainly a more technical approach, it always works and does not require internet access to use, making it invaluable for many situations when the Apple ID or reset tool are not applicable. This is more of Apple moving to the Cloud for services and support, just like the Lion Recovery disk. I don’t remember that I even entered a firmware password. Was there a generic password installed when I received the iMac? If that is the case; would it be in the set-up literature? Or was I “forced” to enter a firmware password when I originally set up the computer? No, you probably set a password for your username on a computer. That login password is for your user account, it is not a firmware password. A firmware password is immediate on boot, it is separate and you probably didn’t set one unless you specifically went out of your way to do so, it is advanced and not easy to set. Contact official Apple Support if you are not sure.